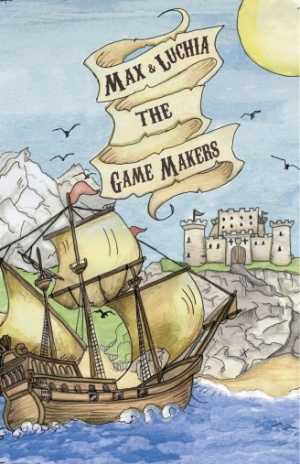 Max & Luchia: The Game Makers, is available to buy through the Black Pear Press website. The author has a few copies too. After saving a man’s life, dyslexic Max meets Archie, a guiding spirit. When he finds out his sister, Luchia, is also under the guidance of Archie, they are given the chance to play the game they created in a scrapbook. Set in a fairy-tale world of castles, knights, spirits and dragons, eleven-year-old Max & Luchia make their way through seven increasingly difficult levels until finally, they are forced to make the biggest decision of their lives. Max & Luchia is a charming story of how friendship, family, and a wild imagination can do wonderful things, resulting in two children (and, eventually, a friend and enemy or two as well) creating a labyrinth world of mind-blowing challenges that see them work together in order to conquer the game. Brooke has pulled out all the stops to create a story that surprises and entertains in equal measure and it’s a book that I’ll happily return to time and again. The novel revolves around Max and Luchia, a brother and sister pairing who design an imagined game, wherein they must overcome certain challenges to progress through the game’s levels. Each level is harder than the last and, with the added complication of Max’s schoolyard bully hovering on the peripherals, there’s a surprising amount of tension in this bite-sized book too. In terms of the delivery, Brooke writes with an obvious excitement that breathes life into the plot and indeed the characters. Max is a charming protagonist who wins the reader over early on, making it exceptionally easy to follow this journey along with him. Furthermore, Brooke’s rich imagination does wonders for the game-world itself as we’re drawn into an unfolding map of vivid descriptions and wild monsters that live and breathe off the page as well as on, and this vivid quality is aided hugely by the presence of illustrations throughout the book – provided by one Seraphim Bryant (a talent worth watching, for sure). Between Brooke and Bryant, an entire world appears before your very eyes and you find yourself so drawn in that you simply must continue rooting and whooping for these characters right through to the end. As children’s books go, this is certainly one that I wish I’d had on my bookshelf a few years back. It’s beautifully written and wonderfully illustrated and, as collaborations go, the Brooke and Bryant dream team is something that I’d love to see more of in the future. A wonderful and exciting tale of good versus evil (and good versus vampires, and dragons, and…), Max is a wonderful character carried along a strong plot, and Brooke should feel truly accomplished with this latest release. Jimmy Cricket tells the story of 15-year-old Jimmy who is forced to move in with his aging grandmother following the death of his parents. As if that wasn’t difficult enough for any teenager to deal with, Jimmy repeatedly falls in with the wrong crowd and finds his adolescence hi-jacked by his best friend, Dean, who often seems to hinder more than help. It’s emotional, touching, and entirely accurate and that’s why, irrespective of the age of the reader, Jimmy’s antics – that involve petty theft, too much alcohol, and, shock horror, the first love of his life – will prove to be completely relatable. Brooke’s prose is accessible, and his tendency to finish chapters at the precise point that you wish to know more is a worthy skill for any writer. I’ve said before that the mark of good fiction is whether it passes the one-more-chapter test, and Jimmy Cricket certainly does. I needed to know what he was going to do next, and I needed to frown judgementally – whilst quietly sympathising – when he made yet another mistake. The reader observes Jimmy pushed from pillar to post by his friends, whilst making a number of typical teenager mistakes with his first girlfriend, Dayla – who proves to be an important character in the book. However, she’s not quite as important as Mark, the latest in a long line of family support workers who are sent to help Jimmy and his grandmother. Overall, it’s a neat little novel. Brooke writes his characters with conviction, creating convincing scenarios in which the reader can’t help but feel sympathy, disappointment, and sometimes even embarrassment as we are catapulted into the all-too-familiar world of teenage life, as seen by Jimmy. 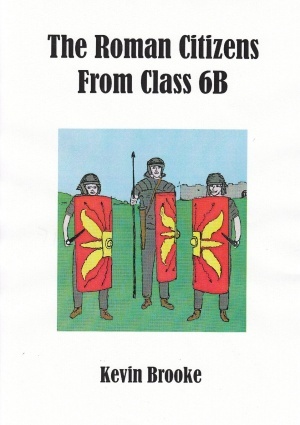 The Roman Citizens from Class 6B was ‘Commended’ in the Words for the Wounded Independent Author competition in 2015. It was recently used as a key stage 2 resource in Malvern Wells Primary school. Ben has an amazing talent – his pictures come to life! When he and his friends Calum and Maisie are transported onto a Battlefield, their Roman adventures begin. Aimed at an approximate reading age of 6-10, the story includes a chariot race in the Circus Maximus, a day in the Roman Senate and a daring rescue of a slave girl called Phina from the lions in the Colosseum. After hiding in the Catacombs, Ben draws one last picture and he, Calum, Maisie and Phina are transported back to England – 61Ad England to be precise where they are soon charging towards the Roman Army alongside Boudicca, the Iceni Queen.